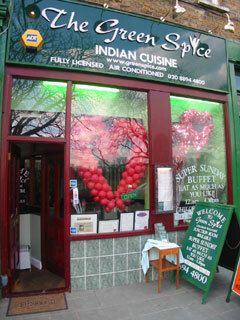 The Green Spice is your local Indian luxury restaurant. Our aim is to serve you with freshly prepared food to make your dining an enjoyable and memorable experience. All our dishes are prepared with the greatest of care using natural herbs and spices and, of course, our master chefs use their own blend of spices and cholesterol free oil. Join us for our Super Sunday Buffet – eat as much as you like for only £4.95 (child £3.50) from noon-4.30pm. For over 5,000 years the land of India, with its hundred races, has provided much that is mysterious and beautiful, together with a rich variety of eating habits, to appeal to all tastes. The scent lies largely in the fragrance of the spices which are so important to the cooking. Indian master chefs use their own blend of spices, including turmeric, cardamom, ginger, garlic, coriander and many more. Of course, an Indian meal cannot be complete without rice, which is believed to be a gift of the gods. It has to be carefully washed and prepared, almost as a form of prayer, before being boiled with a touch of butter or oil. To accompany the meal, the most popular variety of Indian bread, at least in the western world, is Naan, traditionally baked in a Tandoor (a clay oven), and made from a mixture of sugar, dried yeast and a little ghee. Open every day noon-2.30pm and 6-11pm. All major credit cards accepted (not Diners). No service charge.